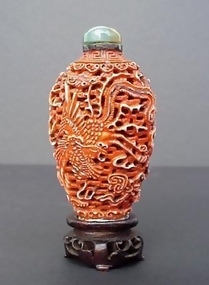 A Chinese reticulated iron porcelain snuff bottle with a dragon and phoenix among clouds beneath key fret and ryui border, neck with a silver rim, jade stopper. The red color is the same as used when decorating porcelain, though in this case it is applied as a solid color. The desired effect is to imitate red cinnabar lacquer. Circa, probably from the Jiaqing period (1796 - 1820). Height 3".